Arya likes all lift-the flap books since the flaps keep her entertained even when she doesn’t enjoy the pictures. So any book that has the lift-the-flap feature is an easy choice for me to read to my daughter. Whose Stripes by Fiona Munro has giant, full-page flaps that are easy for little fingers to grasp. The front cover of Whose Stripes shows a cute tiger set against a contrasting green background. I immediately noticed the white text advertising “GIANT flaps” in bold lettering. Since Arya likes lift-the-flap books so much, I knew she would enjoy Whose Stripes regardless of the pictures or text. Thankfully the giant flaps are as advertised. The right-side of each page contains an additional page with a fold-out design. So each pair of pages actually consists of three independent pages where the right-most one is tucked into its neighbor. The design creates enormous, page-size flaps that even the smallest baby fingers can manipulate. Arya quickly learned how to work the big flaps. She spent most of the book playing with flaps from previous pages. My chief complaint about reading Whose Stripes to my baby is that she was so busy playing with the pages that she didn’t care about reading the book. Colorful pictures and nature backdrops provide a consistent source of entertainment on each new page. The front of every flap shows a bright, two-color design. After I showed her how to open the flaps on the first page, my daughter quickly associated the two-color image with a flap she could open and close. Although inconsequential in our case, Whose Stripes also has a cute premise. Each page describes one animal with stripes that is initially hidden among the background. Behind the flap is a large picture of the animal and bold text with its name. Four animals – tiger, bee, zebra, snake – are featured throughout the book. 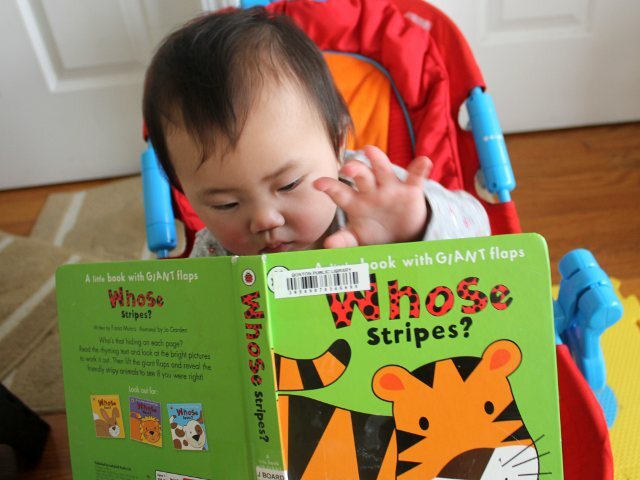 Whose Stripes is a great book for any child who enjoys playing with flaps. Older toddlers who can learn the names of the animals will enjoy opening the flap to reveal the large pictures. Younger babies will enjoy the colorful images and the short length. Whose Stripes costs (including shipping) under $7 new and under $4 used from Amazon.